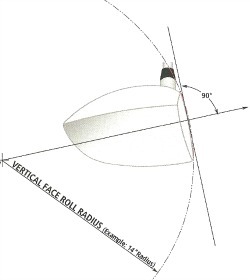 The roll radius of the face of your driver, much like the radius of the horizontal bulge, is another aspect that one should have a look at when choosing your driver head. Ask anyone in club design what it actually does and the answers can be all over the map. Vertical face roll can actually do the wrong thing at most vertical impact locations. It increases the trajectory of the shot on high club face hits and decreases the trajectory on low club face hits. 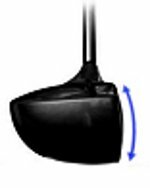 Most golfers don’t realize that the actual stated driver loft will only have that loft at a point which is at ½ the vertical face height. 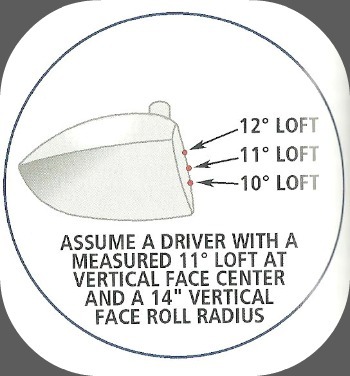 At a conventional 12” radius most drivers that have a loft of 11 degrees in the center, it has a loft of upwards of 14 degrees at the top, and a loft of 8 degrees at the bottom. I guess you had better hit the ball right on the mark in order not to balloon or skull that shot. Vertical radius can be measured by using a Maltby radius gauge, much like measuring the horizontal bulge. Most of the modern big 460 c.c. 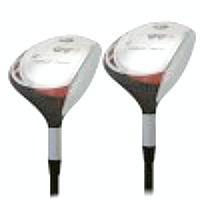 drivers on the market to-day are built with a 12” inch vertical radius, and I bet if you asked that commissioned salesmen in the big box store what his driver has, that he is trying to sell you, you would probably hear all kinds of bull. Look what increasing the vertical face radius to 14” does to the effective lofts. You should have a lot of better strikes of the ball on slight miss-hits, up or down the vertical face. Usually the vertical radius is the same from heel to toe, except now we have the introduction of twist face. We shall all see how this modification will take. HOW MUCH VERTICAL FACE RADIUS? What about going with all flat faces? The problem with designing a driver with a flat face vertically is that it gives the appearance of a much stronger club in the playing position. 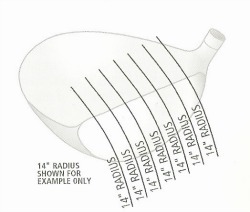 Eliminating vertical face radius is not all that practical because of accepted modern club making and also acceptance as a visual look by golfers, but controlling it and minimizing it is a good thing making it a design variable that basically will not affect a club’s playability. Excessive radius can definitely be a significant hindrance to proper playability. This is why it is good to get into the habit of checking it. Tom Wishon, of Tom Wishon Golf Technology, in the late 90s and early 2000s, started to study new head design, in specific, changing the vertical radius. He observed that with many golfers, high face hits were resulting in launch angles + trajectory flight that was too high and low face hits were resulting in launch angles + trajectory that were too low, for the shot to be close to optimizing for distance for golfers. From all of his observations, he developed the concept to change the vertical radius design of a typical large size (460 cc +) driver head. 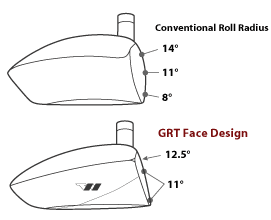 Initially he designed a driver prototype with a flat face from the bottom of the face up to a point about 2/3’s of the face height, and from there up to the topline, he incorporated a 15” radius- some, but less than what the typical driver face radius was at the time for all other companies. Thus, graduated roll technology was born. The entire goal of Tom Wishon’s graduated roll technology in the face design of driver heads is to eliminate the inconsistency of how the vertical radius will change the loft angle up and down the face. Loft is HUGLEY important for consistent distance-every golfer has to understand that basic technical point about club head design. Naturally, this is a plug for the drivers that we use. Wishon’s 919Thi driver heads have had a lot of satisfied golfers over the years that we have been building them, so click on this image for a better look at his fully customizable heads.